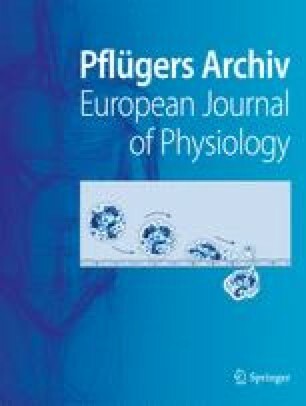 Voltage-clamp technique and intracellular injections of drugs were used to study the adenosine triphosphate (ATP)-evoked depolarizing current response in theXenopus laevis oocytes. The depolarizing current was comprised of a fast transient component (D1) followed by a late long-lasting component (D2). It was carried mainly by Cl− ions. The depolarizing current was better elicited by ATP and ADP than by AMP or adenosine and was not blocked either by theophylline (0.2 mM) or by quinidine sulphate (1 mM). The D2 current was sometimes masked by an ATP-evoked K+ hyperpolarizing current which was blocked by theophylline and mediated via P1 purinoceptors. This study suggests that the oocyte's membrane embodies at least two different purinoceptor's types, each of these types subserves a different set of ionic channels.